It is not uncommon to find it difficult to identify the person behind a name on a war memorial – occasionally there is no one of that name to be found in the CWGC database, more often there are too many of that name with no additional information to indicate where they originated. 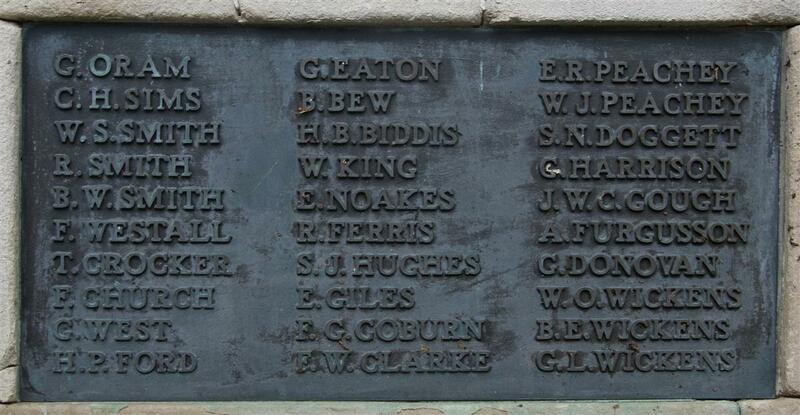 In the case of B W Smith on the Newbury war memorials there is a less common problem – two Benjamin Smiths from Newbury who both died while serving in France in 1917, but only one is on the memorial. The CWGC database yields the information that one was a 39 year old serving with the Royal Berkshire regiment, the son of Mrs. Emma Smith, of Stronghove Hill, Hungerford; husband of Mary Elizabeth Smith, of 17, Berkeley Rd., Newbury, Berks. The second was a 24 year old serving with the Labour Corps, the son of Sidney and Kate Smith, of 4, Church View, West Fields, Newbury. The latter is clearly the BW Smith on the memorial, not only was he born Benjamin Weller Smith but his name is grouped on the memorial with that of his brothers, William and Richard Smith. When the Newbury memorial was planned there was a determination to ensure that there was no favouritism or rank consciousness – so it was decided that the names would be distributed randomly around the bronze tablets. A few exceptions were allowed: the only woman to die (Lorna Ferris) appears first, followed by the town’s first casualty of the war (Jack Himmons); the remainder of the names appear randomly except in the case of brothers, who are usually (but not always) grouped together. The older Benjamin was born in Hungerford and lived in Newbury, but had no middle name; has not been commemorated in either town. Sidney and Kate (née Weller) Smith had four children: Edith Rachel (born 1884), William Sidney (1887), Richard (1890) and Benjamin (1892). The family home, 4 Church View Villas was the original name of No 17 Blenheim Road (just round the corner from the other Smiths at 17 Berkeley Road). 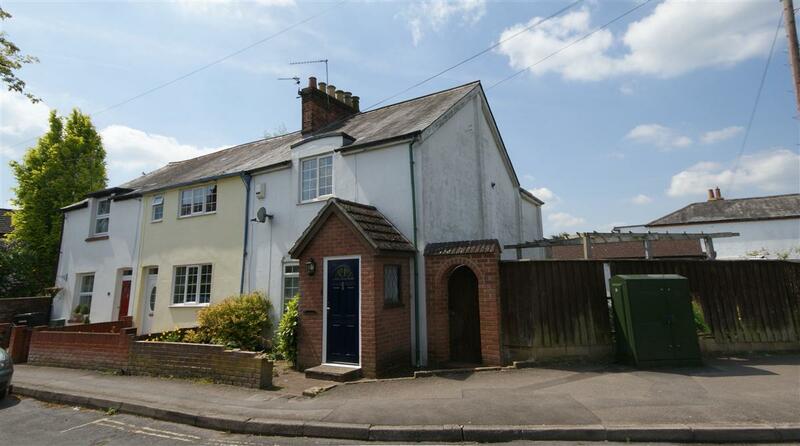 This house was at the northern end of a terrace of four small cottages and was demolished to allow for the road around the corner it occupied to be widened and a pavement put in. The remainder of the terrace (11, 13 & 15 Blenheim Road) is still standing. 'Church View Villas' today - minus No 4. The census return for the household in 1911 shows that all four children were still living at home and that the boys had all found employment in the building trade, William and Richard following their father’s trade as carpenter/joiners, Benjamin as a plumber’s apprentice. Fortunately Benjamin’s service record is one of those that survived the fire that destroyed most such records during WW2. He attempted to enlist in December 1915, but was certified by a doctor as ‘unfit for army’ suffering from ‘both testicles much enlarged’. There are numerous possible causes for this symptom, not specified in his medical record; whatever the cause things must have improved, on 31 January 1916 he was passed fit for service abroad, but not eligible for infantry. He was 5ft 6in tall and weighed 144lbs. He attested the following day on 1 February 1916, a month later his attestation was approved and he was posted to the Divisional Company, Royal Berkshire Regiment. He was posted to the Royal Berks ‘Works Company’ - ignoring his request for a posting to the Army Service Corps (Motor Transport). Very soon after, on 27 March, he was transferred to the 12th (Labour) Battalion, Devon and Cornwall Light Infantry; this recently formed battalion was building up its numbers in preparation to go to France the following month. This rapid deployment to France shows that little military training was required; he going over to work, but not to fight. Certificate of Consent from Plenty's. Unusually the records include a ‘Certificate of Consent’ from his civilian employer, Plenty & Co of the Eagle Iron Works, Newbury. Such a certificate was part of a system introduced by the Munitions of War Act, 1915, that ensured that those employed in vital munitions work could not easily leave for more conducive or more lucrative employment in a less important role. 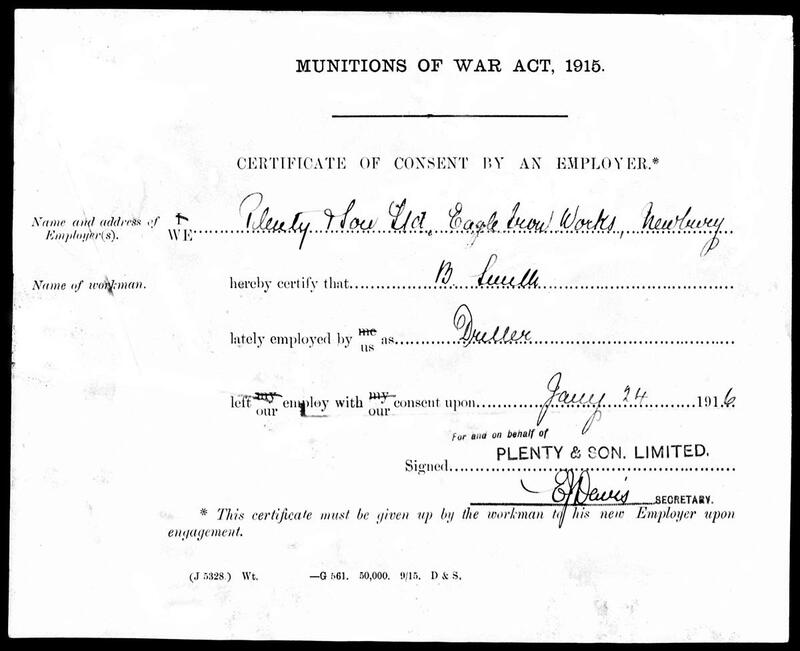 No one could legally employ anyone who had been employed on munitions work for six months after they left their munitions employment, unless they had a certificate from their munitions employer consenting to their departure. Benjamin had worked for Plenty’s as a driller, not a highly skilled role for a twenty-three year old who had been serving an apprenticeship as a plumber before the war. In 1917 all the regimental labour companies were transferred to the newly created Labour Corps. The DCLI’s labour battalion, the 12th (Labour) Battalion, transferred to the Labour Corps as the 156th and 157th Companies of the new Corps; Benjamin served in the 156th. Despite the survival of his service record the circumstances of his death are a mystery, with nothing more than a chit recording: K. by lightning 18/6/17. There appears to have been no court of enquiry or investigation into such an unusual death, but life was cheap in France in 1917. SMITH – Killed by lightning, on June 18, somewhere in France, Benjamin Weller Smith, third and youngest son of Sidney and Kate Smith, of 4 Church View, West Fields, Newbury, age 24. Mr and Mrs Sidney Smith of Churchview, West Fields, Newbury, who had three sons on service, have lost two of them. Not many weeks ago Richard, who was serving in the Royal Engineers, was killed in France. Now comes the sad news that Benjamin Weller Smith, serving in the Duke of Cornwall’s Light Infantry Labour Battalion, was killed by lightning on June 18th, in France. His officer wrote: “No one regretted the accident more than myself, as your son had done his duty faithfully and was one of my best men.�? The deceased had been on service fourteen months, had not been home since joining up, but expected leave this month. He was formerly employed at the Eagle Engineering Works, and was a boy chorister in the Parish Church. The other son, William, is in France. Benjamin was buried in grave H.G.4 in Lebucquiere Communal Cemetery Extension, which, presumably, was near to where the lighting strike took place. It is not known exactly where Benjamin died, or what he was doing at the time; it could have been any number of tasks - Lebucquiere is a village in the Somme region that was occupied by the British in March 1917 when the German forces withdrew to their seemingly impregnable new defences – the Hindenburg Line. There would have been plenty of work for the Labour Corps and every other spare pair of hands because the Germans destroyed everything as they withdrew. Road needed clearing and repairing, new defences had to be constructed, trenches dug, supply routes established, billets built, etc, etc – enough to occupy thousands of men for months. Benjamin's name on Newbury War Memorial, below those of his brothers. Locally Benjamin is remembered on Tablet 11 of the Newbury Town War Memorial and the parish memorial board and roll of honour in St Nicolas’ Church, Newbury. His brother Richard died in February 1917 during a trench raid, his other brother, William, died during the German Spring Offensive in March 1918. All three of Sidney and Kate’s sons had fallen, an unimaginable family tragedy made all the more tragic by the manner of Benjamin’s death by what is generally considered an ‘act of God’.